* If this this launch is temporarily locked, use alternate launch locations listed below. A serene paddling experience down Cache Creek to the dam and back, past the Anderson Flats tule reeds, a few older waterfront neighborhoods, and then through the beautiful oak-studded back hills. This loop is best taken during summer and fall, when water levels are lower and Cache Creek Dam is not releasing huge amounts of water. During winter and spring, if the current is too strong, turn around and take a few side loop trips. In the summer, mornings are best as the midday sun can be intense. From the North Flats parking lot p at the northern portion of Anderson Marsh State Historic Park, carry your boat 500 feet to the soft launch at the end of the creek. Head south (to the left), and after 1/4 mile, you will reach a confluence (1). Take a left (east), turning onto the main Cache Creek waterway, which ultimately will lead you to the dam. Clear Lake’s current form was created thousands of years ago by a series of earthquakes that elevated the northwestern lake basin, cutting off drainage into the Russian River. The water rose until it found a new outlet – Cache Creek – which drains eastward into the Sacramento River. The name Cache Creek comes from Hudson’s Bay Company trappers who cached their furs along the Sacramento River and smaller tributaries. Paddling along, you will pass by Slater Island, among tule reeds and wooded areas. Spring is a great time to watch for Great Blue Heron rookeries, though you will see all types of waterfowl year-round. This also is a favored fishing spot. About one mile into your trip, you will begin to see a series of “oxbows” (2), small side canals that are remnants of old channels where Cache Creek used to flow. The first oxbow comes to a dead end, but the next four actually loop around when the water level is high. Egrets, cormorants, herons, mallards, and an occasional osprey may be spotted. At this point, you begin passing through Highlands Harbor, a small residential waterfront community. At Mile 1.8, you will cross under the Highway 53 bridge and then paddle by the Grigsby Riffle 3, a rock ledge that crosses Cache Creek. Located at a narrow point near the confluence of Seigler Canyon Creek, the Riffle is a natural rock formation that limits the amount of water flowing past and thus controls outflow from Clear Lake. Prior to construction of the dam, the Riffle was the sole means of maintaining lake levels. At two miles, you will cross under Lake Street bridge and begin to enter Redbank Gorge (4), which winds through a few more older waterfront neighborhoods. At about three miles, you start to leave the houses behind and enter the back hill country where you may see deer, wild turkeys, jumping fish, otters, and a myriad of waterfowl. After five miles, you will approach the dam (5), which is currently owned and operated by Yolo County. Heed the danger signs that warn boaters to stay back. This is the site of the 1868 Cache Creek Dam Incident when locals tore down the original dam after waters backed up and flooded most of Lower Lake. The dam was rebuilt in 1914 and remains controversial today. Due to its size, Clear Lake rises to flood stage only after prolonged, high-intensity storms. When this happens, Clear Lake’s natural outlet, Cache Creek, is too small to allow floodwater to leave the lake as fast as it enters. Since the late 19th century, water rights and flooding protection have been in dispute between Yolo and Lake counties. An ongoing series of court decrees attempts to balance the needs of both counties by regulating water level and release. At this point, you can turn around and head back the same route. Should you opt for some additional paddling, some of the side canals through the tule reeds along Anderson Marsh State Historic Park can be nice spots for bird watching, particularly when the water level is higher during winter, spring, and early summer. Access note and alternate launch: Due to State budget issues, the gate to the North Flats parking lot is open sporadically. 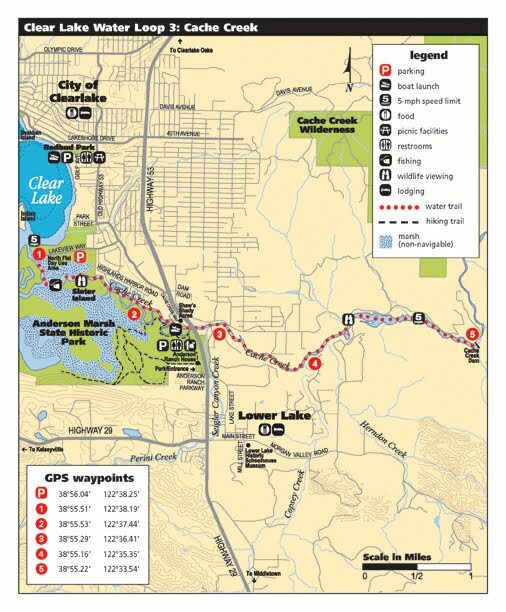 This loop also may be accessed from the Redbud Park boat ramp, located at 14655 Lakeshore Drive in Clearlake. After launching, head south along the shoreline then left at the opening to Cache Creek, past North Flats (red P). Kayaks also may launch for a nominal fee from the friendly folks at Shaw’s Shady Acres, located at 7805 Cache Creek Way off Old Highway 53 (if no one is there, place the money under the front door of the residence).